I read with interest your comments in The Scotsman at the weekend. It’s a fair point you make about there being no movies dealing with the Highland Clearances. Hard to believe isn’t it? It’s one of the most significant landmarks in Scottish history, with no shortage of heartbreak and drama, but no one has yet dramatised it for the big screen. How could that be? Don’t think this is an accident or an oversight because it’s not. I was brought up in the town of Thurso, less than thirty miles from the worst of the Strathnaver Clearances, but the subject was never mentioned at school. Yet there were kids in our school whose grandparents had listened to tales told by their older relatives who themselves were cleared off the land. This wasn’t ancient history to us. But it was a history too shameful to mention. There is a wealth of stories from Scottish history crying out to get made into films but few of them ever do. It’s as if Wallace, Bruce, Mary Queen of Scots, Rob Roy and Bonnie Prince Charlie are the sum total of our history. Kings, queens and battles. Same as it ever was. Period dramas are the stock-in-trade of English cinema and television. There have been hundreds of them, some based on historical events, others on the classics of English literature. They flood onto our screens – and by our I mean Scotland’s – on a regular basis. I’m not complaining about this. My mother enjoys them so why not. But where are the corresponding period dramas from Scottish history? Where are the great movies set during the time of the Reformation, the Covenanters, the massacre of Glencoe, the Darien Expedition, the Act of Union, the hounding of the Jacobites, the Scottish Enlightenment, the trial of Thomas Muir, the massacre of Tranent, the Radical Uprising of 1820, the Highland Land League, the Industrial Revolution, the Victorian slums of Glasgow, or, as you say, the Highland Clearances? The same applies to historical bio-pics. The lives of Robert Ferguson, Robert Burns, John Murdoch, Mary Ann Somerville, David Hume, Thomas Muir, Robert Louis Stevenson, RB Cunninghame Graham, or at the start of the twentieth century – Ethel Moorhead, John MacLean or John Logie Baird – were full of passion, high drama and incident. But where are the movies? If you, or anyone else involved in cinema, are serious about making a film set during the Highland Clearances can I take the liberty of pointing you in the direction of a story that has been screaming out to be filmed since it was first published in 1968. It has no parts for good-looking young actors like yourself. There’s no parts either for gorgeous young women in buxom push-up bras. It may cover the same period in time but Pride and Prejudice it is not. What sustains her in her poverty and old age are her Calvinist beliefs. She believes her suffering will eventually end and she’ll get her reward in the afterlife. Death, she feels, can’t be that far away. The story is set in a geographically isolated corner of Scotland once teeming with love, life and passion but subsequently ravaged, destroyed and then emptied by the Clearances. Today the same rivers run deep, fished and policed by the wealthy, but there is only the rubble of crumbling old buildings where children once played. And sheep. The novel is called Consider The Lilies and was written by Ian Crichton Smith, one of our country’s finest poets. This magnificent book, set in the early years of the nineteenth century, has a very understated opening which in my opinion would translate beautifully to celluloid. In the hands of a Robert Bresson or a Bill Douglas this could be transformed into high art. Consider The Lilies is one of the great classics of Scottish literature. It is not a long novel by any standards, it’s hardly more than 140 pages. You could read it in a couple of hours. But it packs a big punch. That’s the thing. Too many films want to chunter on about an issue rather than skillfully tease out an important story through characters. But you’ll learn more about what the Clearances must have felt like, by reading this novel, than through any academic treatise on the subject. The author has done a lot of the work for you. In his deceptively simple prose, he skilfully draws you into the mind of a bewildered old woman who simply can’t understand why she should have to leave the only home she has ever lived in, the home she gave birth to her son in. Why should she drag her meagre worldly possessions for miles across the open countryside to live on a patch of barren land she has never been to before? She can’t believe that the church elders would ever permit such a thing to happen. Old Mrs Scott can feel the ground beneath her feet shifting in more ways than one. But something magical happens. In the teeth of coercion and bribery, a frail old woman comes to commit an act of such breathtaking yet simple defiance that it is truly inspirational. She learns to say no. Isn’t that the stuff of great drama? As the author explained: “Mrs Scott was to be broken out of her ideology to see how she could cope as a human being.” It is in her stubborn refusal to betray her friends, and in her own quiet resistance to the horrors of eviction, that her humanity burns more fiercely than all the flaming torches of her evictors. Consider The Lilies not only sheds light on the Highland Clearances but is an invaluable piece of our cultural heritage. It deserves to be made into a top-notch movie. I’m sure once you’ve read it you’ll agree it is a source of inspiration, righteous anger against injustice, and an affirmation of dignity and basic human decency against all the odds. I’d recommend shooting it in black-and-white, pacing it nice and slow, allowing the faces of the characters to tell the story as much as their words or actions. Think Bergman rather than Gibson. And it wouldn’t work with big name actors from the south. You’d need local actors from the Highlands with proper northern faces. And most of all, and this is absolutely vital if the film is to be a success, keep Ewan McGregor as far away from the project as possible. Amazing that ‘Consider the Lillies’ has not yet made it onto any screen of any size. Smith’s economy of language is genius and the book as a whole is a classic. Clach air a chàrn. Also worth consideration is Somhairle MacGill-Eathain’s Ban-Ghaidhealach/ Highland Woman. The film ‘Seachd’ does touch upon the subject and though the part concerned short, the point of view of the indigenous Gael more than makes up for the lack of screen time. I’m going to put Highland Woman at the top of my reading list. Good call. Ta. I dont know Somhairle MacGill-Eathain’s Ban-Ghaidhealach/ Highland Woman. Where would I find it? Bella – any collection of his poetry ought to have it (I think it’s in Dain do Eimhir), but I know for sure that it’s in An Tuil (ed. Ronnie Black) and Modern Scottish Gaelic Poetry (ed. MacAuler). For some reason I was thinking Sorley had written a novel I didnt know about! Have copy of said poem in Douglas Dunn’s Faber anthology of 20thC Poetry. of her bent poor wretched head. in the sweat of her food’s creel. for her children’s food and the castle’s reward. rin abrar Aon Mhac Dhè? ri strì an fhìon-lios chèin? a cinn chrùbte bhochd thruaigh. fo fhallas cliabh a lòin. chum biadh a cloinne ’s duais an tùir. tarsainn mìnead ghil a clàir. a corp gu sàmhchair dhuibh an uaigh. is glas a cadal suain a-nochd. You seem to have inadvertently composed a stellar piece of literary criticism Kevin. I must confess that I have not read ‘Consider the Lillies’ but I now intend to do so. ‘Seachd: The Inaccessible Pinnacle’ touches upon the clearances briefly, but otherwise Scotland’s celluloid and literary canons do not afford the topic the significance it demands. Recently published books on the topic are closer to the abhorrent clearance denial of Michael Fry than the truth. They do not stress the traumatic nature of these events. I hope your impassioned plea is answered Kevin. PS: I am delighted to know that someone else thinks that Ewan MacGregor was a piss poor Renton as well. Thanks for the feedback Andy. Agree with you on Michael Fry’s pathetic attempts to draw attention to himself by deny the Clearances ever happened. And of coruse as a ruse to get more media work it succeeded admirably. “Massacre at seven oaks” is also a worthy read as it deals with the Selkirk settlers . Thes were the peolpe who once were the victims of the clearances -arrived in Thompson Man. walked 600-800 miles the fort Dear, thos who survived became known as th Selkirk settlers or cheap labour for Lord Selkirk. Kenneth <ackenzie, Simon Frazer, and William Macgillivray hired the local Matee to kill of the settlers as the were spoiling the trapping grounds around the Red river. I know this is a very short bit of info but the book is a good read. Bergman rather than Gibson…which Gibson do you mean, surely not William Gibson? The longer I live in Australia the clearer I see similarities between the the clearances of the Aboriginal nations and the Clearances in Scotland. Maybe it does need a film(s) to at last talk about the Scottish experience; if I can reduce the suffering of the Gael and the Caledonians to an experience, sorry for that. The aboriginal peoples of Australia suffer from high unemployment, substance abuse, domestic abuse, and poor health with low life expectancy rates compared to the whites. The majority have lost their lands; those who still live on their traditional lands are at last able to retrieve them from the State without any clear indications yet that the retrieval of title to their lands makes any difference to their sad lives. There are an increasing number of films about the current day Aborigines and their plight. These are not blockbusters but are made in most part by the children of the dispossesed. So maybe there is some sign of a resurgent pride in being an Aborigine. They were so long conditioned to believe they were somehow less than the Anglo Saxons in intelligence and industry. As were the Scots. The dispossession of our lands still resonates in our psyche today in many ways. Drew – There are parallels indeed between the fates of the Highlanders and the Aboriginal people. Some would say this is trivialising the plight of the Aborigines and yes it was far worse there. But the boats full of displaced Highlanders to America and Canada were death ships. Their land was stolen, homes destroyed. And after Culloden a culture was suppressed and outlawed and opponents of the Hanoverian regime were hunted down like dogs. The comparisons are legitimate. What poet are you quoting there Drew? I agree on visiting Australia last year it is incredible what still goes on and even land that was given back to Aboriginal People 1. They do not in most instances have the continuity to live their former way of life 2. What was even given back is under threat from Cadmium and Uranium mining…. think of that if you have a penchant for buying new mobile phones etc every year. I went to volunteer in the desert though I had only enough money for the fare. The people were lovely but many were wary too, kids still get taken off them, not as forced adoption any more but on trumped up welfare social work orders. I never really realised all my motivations or things I had in common, the other volunteers were selfish rich self interested. One saying she was studying anthropology therefor studying the people as if they were exotic animals. It was legal to hunt Aboriginal people in the 1940’s and attitudes have hardly changed much towards them in Australian society. I talked to a man not much older than myself who’s father was a lucky escapee of a famous slaughter of people. Nobody has mentioned on the one hand the realist cinema of Peter Watkins, not Rob Roy 1996 that portrayed as a side story the start of the Clearances and Proscription. I for one would like to direct films about Scotland but the last one, a documentary for BBC 2 wasnt shown nor would they let me conclude filming because it was deemed to be TOO SCOTTISH for the rest of (or London) uk’s consumption. Films factual or fiction about Scotland have a world wide audience, except in the South of the South. I was only taught about Scottish history from my mother and it gave me a life long wish to bring some of these stories to life. But we are still gagged. This is a fascinating post, especially from an English perspective. I too would like to read Crichton Smith’s book. There’s another angle on this though, in which the division is not English/Scottish but Establishment history/grassroots history. It may be more fruitful. You talk of the English period dramas flooding our screens – but these are mostly, in fact, American funded or led, drawing on a chocolate box version of a safe English past. Jane Austen sells because Jane Austen concentrates on the manners of the people living in the big houses and not where their money comes from. The fact is, there are no films dealing with difficult parts of English history either. Take the equivalent to the clearances – the English Inclosures. The industrial revolution – and arguably capitalism itself – could not have happened without the mass dispossession of England’s rural population, and the theft of their land was every bit as heartbreaking as that of the destruction of the Highlanders. Did I learn about this at school? I did not. I’ve seen no films about it either. Perhaps concentrating on the theft of land will give us the truth about this. The modern world has been built on the mass theft, by force, of land from people, from the Highlands to John Clare’s Essex to the Punjab and Zululand. That’s the dirty little secret which the filmmakers won’t touch. It’s not about the Scots or the Aborigines being seen as inferior to ‘the Anglo Saxons’ (themselves dispossessed of their lands by the Normans, though that’s another story.) It’s about ordinary people everywhere being considered inferior to industry and profit. Thanks Paul. No doubt we are all done a dis-service by an official British (State) narrative of history. Murdo MacDonald (Prof Scottish Art History, Dundee) does a good line in mislaid history – history which is just ignored because its ‘deemed unimportant’. highland culture – combining banning of music, language and clothes that reflected this. There is no equivalent for that in English history as legislated by the British State, nor could there be. English cultural hegemony persists today – our culture is anglified. There is no doubt that we (Scots) should stand shoulder to shoulder with other people to retrieve a social and political history together – and, as you say, ‘concentrating on the theft of the land will give us the truth about this’. But analsyis of the role of the British State, and the power relations it represents is also key. Of course the Clearances and the Inclosures were different things, and there is an obvious anti-clan cultural element going on in the former (pushed, of course, by lowland Scots as well as English landowners). But the root of both of these processes is economic: land is stolen from poor rural people and enclosed for profit. That’s what happened to the English peasantry from the 16th century onward, and it’s what happened during the Clearances too. In both cases, the processes were legislated for by the British state, and when necessary backed up by the military of that state. The Clearances had the added patina of a poisonous racism towards the Gaels on top of all this, and political motives for wanting to eliminate the clans. What I would like to avoid is a simplistic analysis in which ‘the English’ dispossess ‘the Scots.’ Most of ‘the English’ were themselves dispossessed by the same forces – and often the very same people – responsible for the Clearances. I don’t want to deny the obvious cultural/national issues around them, but it’s important not to be simplistic. As for England – there is actually a clear equivalent of the cultural suppression of the clearances by the British state, it’s just much earlier . Our dispossession started in 1066, with mass theft of land by foreign invaders and the systematic suppression of culture and language. English architecture was torn down en masse and replaced with its Norman equivalent, and for 300 years the rulers did not even speak the language of their subjects. Edward I – your bete noir up there – was French, not English. He’d already got us under the Royal thumb when he came for you. All of this is part of a much wider tale of the theft of land, inheritance and culture of the people of these islands by the state and its corporate arms. Paul – I have to confess I know very little about the English Inclosures. Which is scandalous yes and may confirm your points. They certainly werent covered by Simon Schama’s History of Britain… Where would be a good place to start reading? There’s a few salient points worth making here about the role of “the English”. This is never about national prejudices. Clearances from land were an international phenomena and were a class thing as you say not a national thing. That said, in our own case, it was mainly rich English landowners who cleared the Highlands (ably assisted by Scottish lairds and clan chiefs). And it was almost exclusively wealthy English holiday-makers who turned the Highlands into a place to shoot deer, pheasants, and fish salmon. They came up to 19th C Scotland and early 20th C Scotland in trains the length of Princes Street and killed everything they saw. English guns killed all the top predators such as wolves, wildcats, birds of prey, and then the deer and sheep – with only man as predators – ate all the tree saplings and plants. Result: calamity, deforestation and even more acidic soil. The picturesque Highlands you see today is a barren man-made wildersness which could have been the bread basket of Scotland. I’m all for reversing this, by the way, taxing all land in Scotland by the acre, including all unused land or land set aside for gaming, and repopulating the Highlands. Rich absentee landlords are the scourge of Scotland. Including the absentee owners of the Balmoral Estate. Secondly – and this is the main thrust of the article – Scottish culture has been marginalised, ignored and considered inferior or just not as important as the neighbouring country’s culture. Its a subject that sets my teeth on edge. But its not always conscious. Often it is through a complete lack of interest. Film in particular suffers institutionally more than any of the other arts. And film is arguably the most important arts medium involved in the transmission of ideas from one culture to another. Scotland is ‘the other’ and our cultural endeavours are of as much interest in parts of London or Oxbridge as culture from say Iceland or Norway (both of whom produce wonderful art, film, poetry and literature.) Recognising this is an important step in the process of renaisance and rebirth. The Land magazine is terrific on this stuff; Simon Fairlie is an authority. I’ll root out some books too. Much of ‘regional’ and rural England is treated as marginal by the London-focused Establishment, and this has always been the case. I’m not sure that a line can be drawn at the Scottish border. Of course, there is a line somewhere, and the campaign to eliminate the clans was a crime against humanity, with its own special characteristics. But it was part of a broader process of theft and control. Kevin – the last recorded wolf was killed in 1680 – and bears a long time before that – which is well before the rise of the Victorian sporting estate. You are right about the deforestation etc. but I’m not sure you can place the blame for this so easily. Too much stuff gets blamed on the Clearances by many commentators on here – care is needed to avoid being simplistic. I saw a Mull Theatre production of Consider the Lillies – done as a monologue – which was brilliant. It would be a good subject for a film. One of my fave books has always been The Silver Darlings by Neil Gunn, I always thought it would make an excellent film. While not completely dealing with the clerances it does deal with all the joys and sorrows of life in the Highlands round that time. Yes, I do agree, we have an amazing history, and when I recount stories of Covenanters of clearnaces to English friends and family they are often fascinated. I think there is a rich seam for mining. You’ve given me more books to add to my to read list – damn you! As a Caithnessian I can only nod vigourously in agreement! The Silver Darlings was a book I read first at school. Highland River is another 20th C literary masterpiece. I’d need to check but I’m sure there was a dramatisation made of the Silver Darlings a long time ago, either for film or more likely for TV. There was a time in the late 60s and early 70s when Scottish theatre and Scottish TV drama was groundbreaking. Another subject perhaps! There was a film made called the silver darlings, Clifford evens and Helen shingler. Parts of it was I believe shot in wick and surrounding areas. The Silver Darlings was indeed filmed at least once just post WW2 largely on location around Caithness & the North East. Butcher’s Broom is a powerful tale indeed! There is a canonical history, just as there is a canon in classical music. Those included in the canon – Beethoven, Bach, Schubert – may be uncontroversial enough, but those excluded are often so for mere accidents of history – no-one got around to publishing their collected works or their career was eclipsed in their own time by a more eminent rival, and such other happenstances. Imagine the skewing effect if political influences had also been at work – what would we be be listening to now? Nothing but Elgar? Our history has that strange sound, selected partly by chance but mostly by political calculation. It’s why peer review is overrated as an academic filter – like propagates like. My recommenadation for dramatisation would be John Galt’s ‘The Entail’ (with his editor’s daft ending removed). Parts are quite unbearably moving. Worth pointing out that the xclassocal canon has been corrected over time: Schubert was a pretty minor figure during his own lifetime, and Bach had faded into some obscurity until his works became more well-known via Mendelson and the like. Meanwhile figures who were huge at the time have faded, like Spohr. Point I’m making is that these things can be changed: we’ve largely eradicated the worst stereotypes of Scots in culture, the process of correcting the history books is underway. I knew that was what you were alluding to Paul. Go for it and good luck! You made an important point earlier about being careful not to treat the whole of England as the same. True that much of the north and the other extremities are ignored by the London establishment, much like Scotland. It is equally important to make the right noises and take the appropriate actions in order to change that situation. Scotland is taking that course now and I truly believe that the major changes about to happen will in the end be for the common weil of most of the UK, at least those extremities. My mother who is nearing 70 (and also, coincidentally, a Mrs Scott) was recently evicted from her south-east of England council flat as, having two bedrooms, she was deemed to be enjoying too much space. Had she stayed, she would have been given a smaller home at a higher rent (new tenancy). She has fled (home) to Scotland. Couldn’t agree more. As a fellow Caithnessian, I can’t help but feel disheartened by the lack of knowledge, both locally and nationally (myself included), towards the Highland Clearances. While travelling south on the A9 last summer, I decided to stop at the poorly signposted historical site of Badbea for a nose, where it turns out twelve families lived battered lives on the cliff edge for close to a century, teathering their children and animals to the ground as a result of being cleared from their homeland to make way for sheep. How they survived on such uninhabitable land is beyond me. But in comparison, to think that an oscar winning movie telling the story of the unfortunate stammer of a king exists is simply “no wise”. I am curious about the Williamson who was inoculating against deadly illnesses in Caithness. Because in Shetland Johnnie Williamson invented a method of inoculation that he used widely. And it’s not so far from Insse Catt to Cattaness! Could I recommend Wendy Gear’s excellent, meticulously researched, book ‘John Walkers Shetland’ on the Clearances in Yell in particular. Because the ‘Jacobite’ element is entirely absent in Shetland, and the absence of deer, grouse or much in the way of salmon militated against ‘sporting estates’. So it was purely economic. Wendy dug in the archives and there are the letters showing how people resisted, and others collaborated. Thanks for an interesting and stimulating chain of discussion. @Bella, your choice of directors was interesting, Kelly Reichardt or Andrea Arnold sprung to my mind. Or Lynn Ramsey, whatever happened to her? even if its a wee bit solidarity – its better than nowt -hah! The Irony is that some of the dispossessed then committed similar atrocities upon the indigenous populations of their new homelands in North America. Jim, you seem to be one of the few who highlight this particular difficult aspect of our history. Was it nature or nurture that drove the Scottish (European) diaspora to try to eliminate the native population of what we call North America? I’m a scottish writer currently working on a novel set in 1912 which draws together the barbarity and legacy of the Highland clearances and the scottish suffragette movement in Glasgow. After a period of family research for my dad I found that my great-great grandmother came down from Lewis to work in Glasgow speaking no english and making a life for herself here. My intention is to translate this work into a screenplay for submission to the BBC drama department. Fingers crossed it makes it to the screen sometime soon! Am sure James McAvoy would do a fantastic job in one of the roles! Consider the Lilies is an amazing book and has been a massive inspiration for this work! I’ve been trying to know more about the Scottish culture and history quite recently and most history books tell me exactly the same (You know, Mary, Rob Roy, William Wallace). I thank you all for your comments. Now I have several people, authors, events and books to look forward. I hope my country, Chile, has at least one copy of the book mentioned. My sister in law is an amateur genealogist, and helped me trace my mother’s family, who were cleared out of Sutherland. There were two really striking revelations – fully a third of her father’s family were drowned at a stroke with a clearance ship en route to Canada. Just as poignant, many of the cousins who did make it to Canada were wiped out at Vimy Ridge or Passchendale. Its effects go deeper than just the bare statistics. My sister once played the old woman in an adaptation of Consider the Lilies. It’s a great idea for a film. A person with Calvinist beliefs would be God-fearing, not god-fearing. Great letter and some great comments and pointers to some things I need to follow up – on both sides of the border. Thanks. This got me thinking: what movies have there been on associated themes that have been big commercial successes? Because that means Hollywood for the most part – aimed at US + global audiences. Far and Away (Ireland + US, Tom Cruise + Nicole Kidman, Ron Howard), Australia (Hugh Jackman + Nicole Kidman), and Rob Roy (Liam Neeson + Jessica Lange, United Artists) spring to mind. I believe that there has been a television adaptation of ‘Consider the Lilies’ made decades ago- around the same time as the adaptation of ‘Sunset Song.’ I’m also aware that there are screenplays in existence for ‘Confessions of a Justified Sinner.’ Why have these not reached the big screen? They are simply too clever and complex for the US producers and distributors who want to know that the product will attract bums on seats. The only way to get these projects into production is to make them as low budget films aimed at either the European film festivals or as films for television and hope that the cinema goers are more intelligent than the money men give them credit for. The actress Anna Hepburn has been performing a one-woman production of ‘Consider The Lilies’ for many years and revives it periodically. If you ever get a chance to see it, do so, as it is a very very powerful production. Make a film in black and white with a septuagenarian as the central character about a little known aspect of Scottish life with no well-known names and the punters will simply stay away. Bill Douglas and Robert Bresson made austere, challenging, art-house movies which appeal to a limited audience. What you need is a Ken Loach who emphasises the contemporary relevance or you go for the full-blown Hollywood with Ron Howard or a MIchael Caton Jones. Or a BBC co-production with Canadian television. Oh, and as for Ewan McGregor, he was terrific in The Impossible. Films are made to be seen by and to entertain as wide an audience as possible. That’s the genius of Braveheart: historical rubbish, but cinematic gold. Big name actors and actresses, an accessible screenplay and an appeal to a broad audience. Then go for the Johnny Ramensky story! What is this responding to? There, they’re and their. Or, to whom is this post responding? Oh! I see! It is a response to the original writer’s misuse of grammar in the opening paragraph of his open letter. My way of thinking is to engage with the argument, rather than focus upon the grammar or its misuse on the web in general. Otherwise I would spend my time parsing and correcting the language at the expense of engaging with the ideas. Is that how we define a great novel these days – whether it’s made it to the silver screen or not. Perhaps we should encourage original screen writing as week as the appreciation, and reading, of Consider The Lilies in its original form. I’m not completely against adaptations of novels but if it ain’t broke I see no need to fix it. Phyllida Law or Sheila Reid, both great Scottish actresses who could do the part justice. I gave my sister the book many years ago and she adapted it as a play and performed in a residential school that she ran. Needless to say she played the old woman. However, it was deeply moving, not least because my paternal lineage were Ross family from Sutherland at the time of the clearances. Any film made about this should not have well known actors in it! If James is looking-in the story of Raasay being cleared in the 1850s by its Scottish owner George Rainy, who had made a fortune as a slave-owning sugar mogul in Demerara is fascinating and deeply troubling. It also links Sorley MacLean who wrote poems of this episode, the slave colonies of the Caribbean, and Australia where the people from Raasay were sent after being banned from marrying by the new owner of the island, Rainy. With an accomplished writer this could be an epic and disquieting tale. Consider the Lilies is, as Kevin Williamson says, a classic in Scottish literature. Every school library should have one. Actually, are there any school libraries left? Also whats with the words throughout the article and letters starting with “f” that are transposed with the second letter of the word? iflm, ifrst? Youse guys got a virus? I played Mrs Scott on both film and stage. First a film on location in Newtonmore for a schools production for Higher Plus. I believe it was shown in schools and during the night on Open University. It was beautifully produced and the minister was played by the amazing actor Mike Mackenzie. I have video tapes if anybody’s interested. The play was in Gaelic and directed by the late Simon Mackenzie. It was a version Iain Crighton Smith wrote BEFORE he wrote Consider The Lilies. It was a very powerful piece and played across Scotland in village halls and Theatres. The Cheviot, etc. showed as much as was possible of the atrocities of the Clearances and their aftermath. 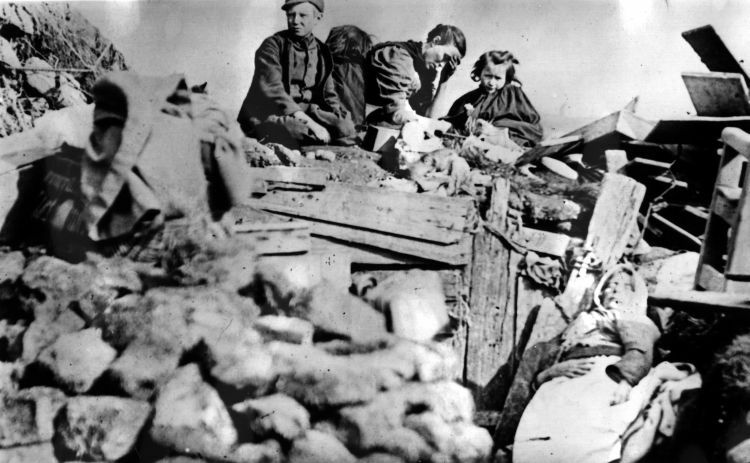 One would hope a film would not only cover the Sutherland clearances but those of the Highlands and Islands ,including the ‘forced’ emigrations from Lewis and the Uists in the 1920. As an Irishman, I grieve for the tale of horror that was the oppression of the Gael over the last 300 years. It differs little from that of Ireland, in the methods used. Massacre, famine, (who knows about the great Highland famine, which overlapped the Irish one, and led to a million dead or fled, as refugees?.) and much else besides. One thing that is not yet recognized, however, is the massive ecocide of the land itself, part and parcel of the Ethnic cleansing that took place. Where once stood the great Caledonian forest, now stands bare hills, massive erosion, poisoned soils, and not a lot else. The bareness of the sporting estates is frightening. It is the reason why only a quarter of the original forest is left, even after years of re-planting. The ecocide accompanied the ethnocide, and was a the instrument of it, and the loss to present day Scotland is massive. Both the population and the rural economy are half the size they would have been. This is why there is so much hysteria and barely concealed guilt amongst the great land owning Oligarch’s of still extant Feudal Scotland. If there are only a thousand of the “Great land owners”, today, it is because of the destruction and displacement of a million other Scots…..this is an inescapable fact, and one that needs to be hammered home constantly. The great land holdings were mainly the proceeds of great crimes, and there is therefore no moral right to them today. Discuss. This is brilliant, but not surprising that the subject has not been done by English or American agencies…however, a little surprised that even a low-budget film has not been made in Scotland (by Scottish film makers) and put out on the independent circuit. I hope that many get done baring the truth of what happened. Will be reading “Consider The Lilies” asap. My wife’s english teacher at Oban High school was Ian Crichton Smith and she worshiped him, as did all his pupils, who considered him a friend as well as a mentor. She reckons his mother was his inspiration for Consider the Lillies. Lets hope your comprehensive list gives someone inspiration to some aspiring film maker. For my part, Ive been trying to stir interest in one of Scotland’s great untold stories- that of Robert Bontine Cunninghame Graham. The Cunninghame Graham Society was formed a couple of years ago to address this deficit, and they hold regular meetings. Membership is only £10 per annum, and well worth the money. Thank you for all the links and Books/Authors etc. I have got into this pretty late, I got talking on the net a while back, and by the replies I was getting, it was clear, I really had no clue. “You don’t know what you don’t know” right. I knew they “HolyWood” versions, BraveHeart – etc I knew it was mostly cosmetic and 95% fiction. The FOI act has allowed a lot of things to be uncovered. So I started researching and reading other peoples blogs and links to who ever….it opened my eyes up big time. I was advised to read a few things “The Poor Had no Lawyers” Andy Wrightman which was a real eye opener. It made me change a lot of the ways I was brought up to think. This gives you a snap shot of the Breeding of entitlement which Scotland was facing….. Wealth does not automatically mean full employment and the end of net emigration. But provided sensible policies are pursued, it is possible to see how this situation could be used to re-equip Scottish industry and renew outworn social capital thereby providing the expansion necessary to absorb Scotland’s excess labour and the increase in productivity required to raise incomes. Thus, for the first time since the Act of Union was passed, it can now be credibly argued that Scotland’s economic advantage lies in its repeal. When this situation comes to be fully appreciated in the years ahead, it is likely to have a major impact on Scottish politics, since it is on social and political grounds alone that the case for retention of the union will in future have to be based. at least until she has managed to catch up. Economic conditions in Europe and above all in England, with whom Scotland will remain closely tied in trade, are of particular importance. Even with greater diversification of Scottish trade to Europe and to North America, an impoverished England or one perpetually suffering the rigours of demand restraint would have most serious consequences for the Scottish economy. The oil prices since the Yom Kippur war make this a much more serious matter than could have been imagined before; and it is now likely that transfer of North Sea oil to Scottish ownership would occasion much bitterness in England if not an attempt to forcibly prevent it. England would, of course, be no worse off than most of the Continental EEC countries in this respect; indeed, probably there are better chances of finding oil in the Celtic Sea or the English Channel than are open to most of them. If therefore the other countries can adjust to the new energy situation, England should be able as well. If, in five years’ time North Sea oil is contributing massively to the UK budget, while the economic and social condition of West Central Scotland continues in the poor state that it is today, it would be hard to imagine conditions more favorable to the growth of support for the nationalist movement. According to the painstaking calculations of Cambridge University economic historian, Angus Maddison, India was the world’s largest economy for the majority of the 1,700 years before the entrenchment of the British East India Company. India had accounted for as much as 33% of global GDP – more than three times that of the whole of Western Europe combined – with even a GDP per capita often exceeding that of Britain. During the eras of loot, war and colonisation that preceded the British Raj, the ‘Indian way’ remained largely intact and as a result, India was still the second largest economy in the world, briefly overtaken by her giant sister civilisation, China (which was also subsequently brought to her knees by Imperial Britain). One of Mahatma Gandhi’s principle grievances against the British was not merely that of Britain’s presence in India – he even accepted allegiance to the Crown. Instead, it was how Britain had systematically dismantled painstakingly nurtured Indian systems of administration, food and water management, industry, grassroots economic prosperity, education and social cohesion. “When the British came, there was, throughout India, a system of communal schools managed by village communities. The agents of the East India Company destroyed these village communities. Instead of encouraging education, the Government encouraged drink.” William Durant. The story of Henny Munro comes to mind…and is representative of Scotland’s disdain for its own people. More paranoia. Yawn. If only there were significant suppporters of Scottish nationalism who could fund this sort of thing. Obviously Connery, Souter, Welsh, that obese couple from Ayrshire who won 80 million on the lottery and old Rupe Murdoch have got better things to spend their money on. Iain Mac a’Ghobhainn’s book is a master piece, making several revealing points. Yes make it into a film somebody.